“How have we come to this place, this cold, hard, killing ground? 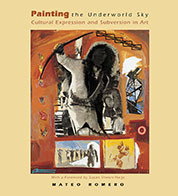 How have we come to this fourth world, a world of violence, darkness, greed, lack of compassion for human life, punctuated with brief flashes of light and hope?” Painter Mateo Romero uses a bold, muscular style and thick, expressive paint to expose the fault lines and tragedies afflicting Native people today. At the same time, he offers a meditation on the difficult yet artistically stimulating process of cultural diaspora and return in which he and many other Native artists are engaged. The fifty paintings reproduced here and the artist's reflections on his own life and that of his father lead the reader to a profound appreciation of the power of Pueblo song and dance to spark those brief flashes of light and hope in this dark fourth world.